Danh Vo at the Solomon R. Guggenheim Museum. Public service images aimed to dissuade Soviet citizens from drinking. Chinese woodcuts at the end of the second Sino-Japanese war. Jed Henry, Rickshaw Cart (2011), color woodblock print, 9 x 7 inches. Mokuhankan Woodblock Prints, Tokyo. Courtesy of the artist. The joint creation of American illustrator Jed Henry and Tokyo-based mokuhanga master printer David Bull, Rickshaw Cart is the first of their ongoing series, Ukiyo-e Heroes. 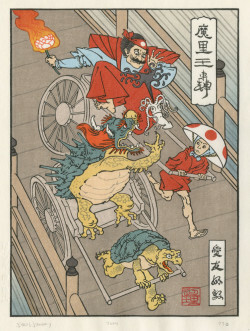 Each of the prints, which now number more than a dozen, places videogame characters of the past 40 years in the stylistic world of Edo-period Japan through hand-cut and -printed woodblocks, published like their forbears in inexpensive, unlimited editions, and distributed (unlike their forbears) through the Internet. The appearance of these old friends—Mario, Link and Princess Zelda, the robotic Mega Man, complete with his forearm cannon—in this unexpected setting can delight the inner nerd of viewers whose youth was spent glued to a home gaming system or pumping quarters into a video game console. 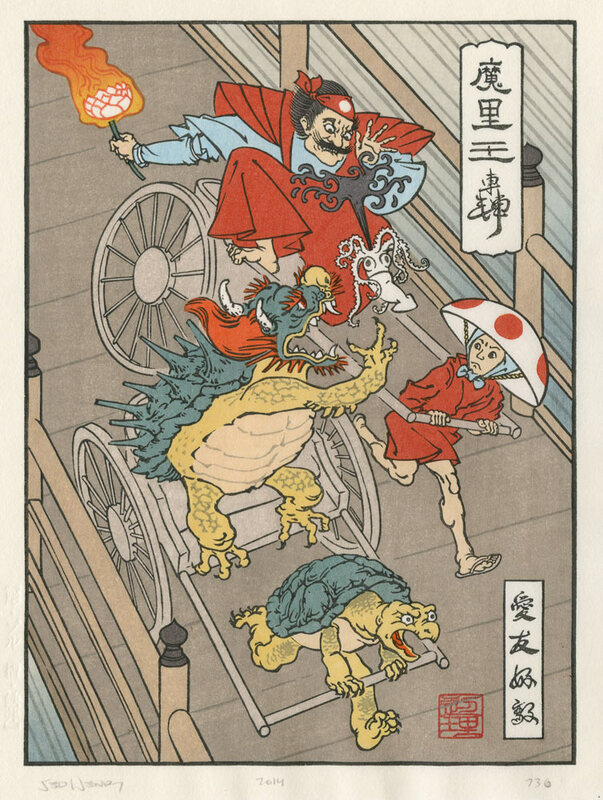 Ukiyo-e Heroes pays homage to Japanese influence on the visual design of videogames as well as to the traditions of Japanese woodblocks. It also resurrects an essential characteristic of those earlier prints that has been often overlooked in celebrating Ukiyo-e artistry—their original appeal as totems of mass-market entertainment. Ukiyo-e translates as “pictures of the floating world” and the genre flourished with the rise of urban, mercantile life in the Edo (1615–1867) and Meiji (1868–1912) periods. The prints were popular and populist works of mass-produced art, depicting beautiful courtesans, Kabuki actors, romantic sagas and famous landscapes. Their production was an overtly commercial enterprise: publishers commissioned and financed the work, artists designed the images, carvers translated those designs into matrices, and printers inked, registered and hand-printed each block of the intricate, multicolor compositions. Utagawa Kuniyoshi, Takiyasha the Witch and the Skeleton Spectre (ca.1844), color woodblock print, 14 3/4 x 9 1/8 inches each. Ukiyo-e Heroes are similarly souvenirs of a popular public amusement, and are also produced in unlimited editions through a clear division of labor: the images are designed by Henry, carved by Bull and printed on Echizen Hosho Washi2 paper. Prints such as Infestation,in which the heroine Samus (from Nintendo’s science fiction game Metroid) battles swarming jellyfish, wed the dynamic design and delicate physicality of antique Japanese prints to the visual culture of one of contemporary Japan’s most influential exports, the video game. Jed Henry, Infestation (2011), color woodblock print, 9 x 7 inches. Mokuhankan Woodblock Prints, Tokyo. Courtesy of the artist. For many young players, the video games and home gaming systems that boomed in the 1980s constituted their first exposure to aspects of Japanese visual style, much as manga and anime3 do for younger audiences today. Henry, a children’s book illustrator with a degree in computer animation, cites game designer Yoshitaka Amano an early artistic influence.4 Amano was responsible for Nintendo’s Final Fantasy as well as the original 1967 anime version of Speed Racer, and Henry used to draw from the game instruction manuals as a child. This eventually led him to a broader interest in Japanese visual culture, extending back to those woodcut compositions of arched bridges and graceful geishas that, for many Westerners, remain essentialist exemplars of Japan. Henry observes that prints such as the Kuniyoshi triptych Takiyaha the Witch and the Skeleton Spectre (ca. 1844) can be seen as aesthetic precursors of Japanese gaming design.5 The drama between the looming skeleton and the intrepid heroes resembles, he says, “an end-of-level boss fight” (the culminating challenge between a gamer and a larger-than-life-antagonist who must be vanquished to move on to the next level of play). Bull, who is English, was working as a computer programmer in Toronto in 1980 when he was first smitten by Ukiyo-e. Six years later he moved with his family to Japan to learn mokuhanga technique largely through self-study, copying the masters while teaching English to make ends meet. In 1989 he undertook the ambitious project of reproducing the 18th-century Hyakunin Isshu (One Hundred Poems from One Hundred Poets) of Katsukawa Shunsho. It took ten years to complete, but its success established his reputation and enabled Bull to devote himself full-time to block cutting and printing. Jed Henry, Fox Moon (2012), color woodblock print, 9 x 7 inches. Mokuhankan Woodblock Prints, Tokyo. Courtesy of the artist. Mokuhanga print techniques have, similarly, spread far beyond their original domains. 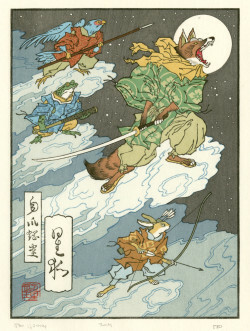 Ukiyo-e aesthetics and techniques have been adopted and adapted by Western artists since the first waves of 19th-century Japonisme. The Shin Hanga movement of the first half of the 20th century involved both Japanese and Western artists and melded nostalgic Ukiyo-e qualities with more contemporary compositional structures. Prints such as Yoshida Hiroshi’s Grand Canyon (1925) exhibited a broader palette and a larger scope of subject matter, aiming for a more global audience. More recently, Crown Point Press began taking American and European artists to Japan in 1982 to work with master woodblock printers, kicking off a widespread interest in Japanese woodblock. Chuck Close (who worked with Crown Point and with Yasu Shibata) and Neil Welliver (working with Shigemitsu Tsukaguchi) are just two of many who have worked closely with Japanese master printers. Meanwhile thousands of artists around the world pursue mokuhanga technique on their own [see April Vollmer’s article, Art in Print, Jul–Aug 2012]. 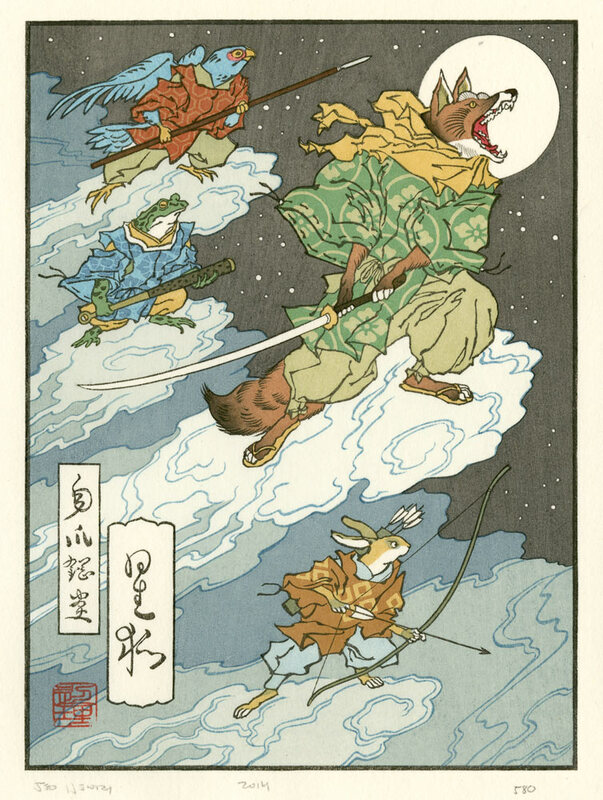 Ukiyo-e Heroes represents a natural evolution of these trajectories. The gaming world, like the floating world, is one of limitless (if virtual) pleasures, a place of adventure and simulation where players can become anyone and do anything. Henry and Bull offer a bridge to both history and material presence, inviting a community rooted in virtual existence to engage with tangible objects. The prints—visually dynamic, funny, and reverent about both sets of sources—may be regarded as low-tech ephemera or as part of a continuum stretching back to the masterpieces of Hokusai and Hiroshige. 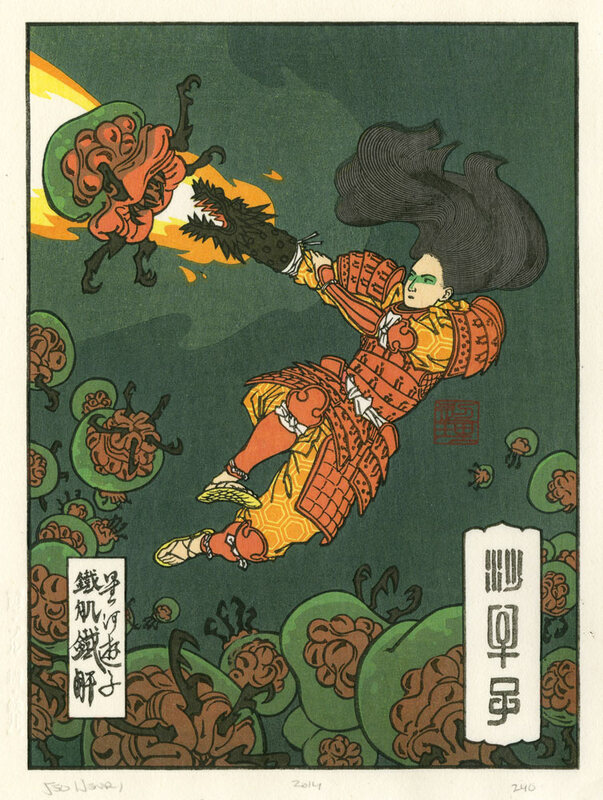 Ukiyo-e Heroes reminds us that those prints were also once low-tech ephemera.